Colds and coughs go from one of us to another in winter and stomach bugs can be rife in summer. But it might not all be down to the man who sneezed on you in the newsagents' or the toddler who stuck his hand in your mouth (true story) at the weekend – the germs you're picking up may well be lurking in unexpected places in your home. So, with the help of Chartered Environmental Health Practitioner, Dr Lisa Ackerley, also known as The Hygiene Doctor, and biochemist, Dr Chris Etheridge, we look at where those nasty bugs might be hiding, and the best ways to get rid of germs – and, ideally, to prevent them flourishing in the first place. You can find more cleaning tips, hacks and advice on our dedicated hub page. 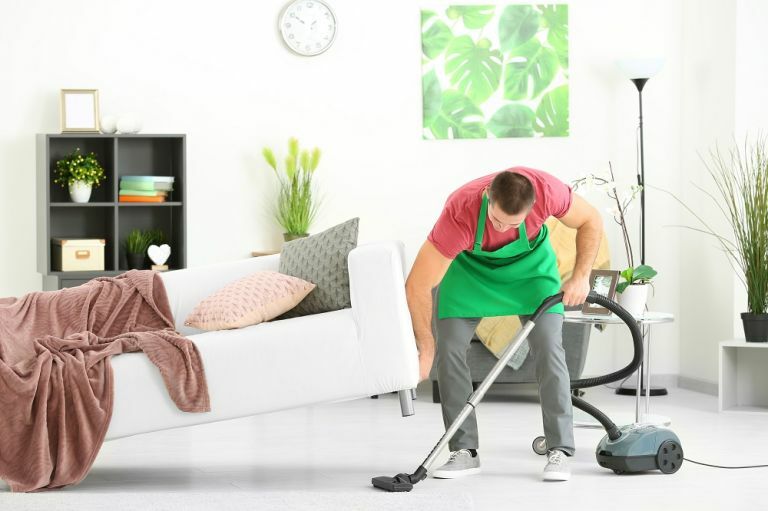 We’re careful to keep on top of bacteria in our kitchens, bathrooms and furniture surfaces, but deep within the fibres of the household carpet are bacteria and dirt that can’t be removed by vacuuming alone. Even in short pile carpets. Dr Ackerley advises, 'Regular vacuuming may make your floors look spotless but deeper down, there can be some unpleasant health risks. Just by keeping your shoes on when entering your house, you may transfer health hazards from outdoors into your home, which could include bacteria such as Campylobacter, strains of E.coli, Salmonella and even parasitic worms into the flooring throughout your home. 'If you have small children playing on the floor, this type of contamination may be transferred from surface to mouth leading to a risk of illnesses causing diarrhoea, stomach pains, nausea, vomiting and fever. Use our guide to cleaning your carpet in 10 easy steps to get the job done properly. Use our guide to find out how to get rid of dust mites. A vacuum cleaner for pets and pet hair and a carpet cleaning machine; VAX's Platinum Power MAX carpet washer, for example, removes 93 per cent of bacteria along with other fungi and allergens lurking within your carpets. Shop for the best vacuum cleaner for tackling pet hair. Use our guide to find the best machine at the best price. A weekly wipe: all knobs, handles and switches, even the ones that look clean, should be wiped weekly with a wet cloth. Wash hands: 'It is always important that everyone in the household washes their hands before eating and before touching their eyes or nose to help control family illnesses – just because one person is poorly it doesn’t mean everyone has to catch the illness! Our life is literally often in our own hands!' says Dr Ackerley. e-cloth’s Home Starter Kit has all you need to make the switch to quick and convenient chemical-free cleaning and remove dirt and bacteria with just a wipe and water. Cutting boards are another place where harmful bacteria could be transferred from raw foods to ready-to-eat foods (cross-contamination). If not cleaned properly, the boards may appear to be clean, but they could harbour bacteria which could be transferred to any other food being placed on the cutting board – which puts health at risk. Kitchen surfaces need careful hygienic cleaning if they have been contaminated by raw foods. Use antibacterial cleanser: 'Make sure to always clean your cutting board hygienically after using it, sanitising it by using an antibacterial cleanser (which cleans and disinfects), using the dishwasher on a high heat (not for wooden boards) or washing in hot soapy water, then carefully rinse by pouring just boiled kettle water over in the sink,' says Dr Ackerley. These cleaning hacks that don't require harsh chemicals – if you're looking for a more eco-friendly approach. When is the last time you’ve cleaned your keyboard? If you don’t remember, that’s not a good sign – it’s probably swarming with germs and bacteria. Because it is so frequently touched and contains tiny cracks, it is a place where food and bacteria can be found. What’s more, lots of us eat at our desks, meaning our hands could be germy whilst we munch on a sandwich, and equally food drops into the keyboard. Clean it! 'Make sure to always shake out any crumbs and dust and wipe it down regularly using an anti-bacterial wipe particularly if you share with others, who may not be as hygienic as you (50 per cent of office workers don’t wash their hands after using the loo),' says Ackerley. We like a bit of Zoflora – check out how to clean and disinfect with it in our guide. 'Wash tea towels separately – collect them weekly and wash them all together on a hot wash (over 60°C),' says Dr Ackerley. 'Hot wash heavily soiled items (over 60°C) or if this is not possible because it would wreck the fabric, use a lower temperature and a laundry sanitiser which you can buy from most major supermarkets,' recommends Dr Ackerley. Always leave the washing machine door open to allow air to circulate and regularly clean the rubber door seal and detergent drawer. Do one very, very hot wash: 'Make one weekly or at the most monthly hot wash at over 90°C (I do white towels at this temperature) to spring clean your washing machine of microbes and stop any smell building up,' says Dr Ackerley. Use our guide to cleaning your washing machine to ensure yours stays germ-free. What’s lurking behind the toilet? Probably germs, mould and dust. A hard to reach area, people may skip over this section when cleaning the bathroom as angles and pipes make it hard to clean properly. 'Keep toilet cleaning products separate from your other household cleaning items so that they don’t get mixed up and used for kitchen cleaning,' recommends Dr Ackerley. Our best mops for hard floors AND our best mops for tiles. Both picks are chosen for effectiveness, ease and, of course, price. Use our guide to cleaning a toilet, too. Fridges often get overlooked when it comes to cleaning, yet they can become contaminated from raw foods and left-over food that has gone mouldy, which can transfer to other food stored in the fridge. A sound fridge-cleaning routine needs to be part of the cleaning routine and is a good idea to get the shelves out once a month and wash in hot soapy water in the sink and dry with a fresh clean tea towel or paper towel before returning to the fridge. For areas of the fridge that are used for raw meat, chicken, fish and raw vegetables, these may need a hygienic clean with is safest with an antibacterial spray (or a final very hot water rinse – carefully pour kettle water over them in the sink) and use paper towel to dry just in case you missed a bit – you don’t want harmful bacteria on your tea towel! Good hygiene after the fridge cleaning: after cleaning, put the tea towel in the laundry basket, ready for a hot wash. Keep raw foods away from ready-to-eat foods. 'I use a box or meat drawer for raw meat and poultry, and a drawer for veg that will be cooked, such as carrots, and a separate area for salad items. That way the “dirty” foods are kept from the “ready-to-eat” foods, reducing cross contamination risks.' says Dr Ackerley.